Definition - What does Chakrasana mean? 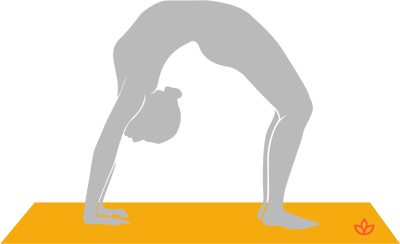 Chakrasana is a strong back-bending yoga asana. It is popular in many forms of yoga and is part of the primary series of Ashtanga yoga. As well as being a back bend, chakrasana is seen in yoga as a heart opening posture and is thought to work on the heart chakra. The name comes from the Sanskrit chakra, which means “wheel,” and asana, which means “posture” or “seat.” It is so called because the body forms the shape of a wheel when in this posture. Chakrasana may also be referred to simply as wheel pose. Chakrasana is also sometimes known by an alternative Sanskrit name, urdhva dhanurasana, which means upward-facing bow pose. Just launched: The Yogapedia Podcast! There are many reported benefits of chakrasana. It is thought that as well as releasing physical tightness in the spine and body, the heart opening effects of the posture can help release emotional disturbances. Some describe this effect as unblocking energy that has become stuck in the heart chakra. Others see the posture as having more of a balancing effect on the energy of the heart chakra. Chakrasana is mentioned very early on in ancient yogic texts. It was one of the 84 asanas of Lord Shiva’s classic yoga, referenced in the "Hatha Ratnavali" around 1600 C.E. What can the chakras tell us? How do the chakras help us understand our spiritual growth? How does twisting in yoga help with detoxification? How do you know what type of yoga you're in the mood for?